Want more DIY plans? Visit MyDIYPlans.com for instant $5 plan downloads! CLICK ON THE BANNER BELOW FOR MORE INFO! 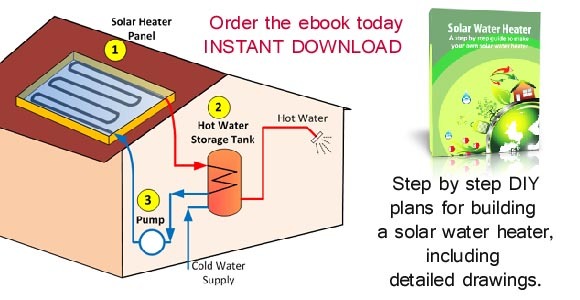 The Solar Water Heater ebook is available in PDF format for instant download. 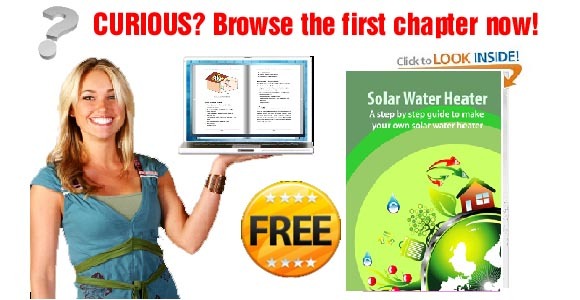 CLICK HERE to order the Solar Water Heater ebook now! Let the power of the sun heat your water instead of gas or electricity, and save up to 40% off your energy bill. instructions, and a list of materials. 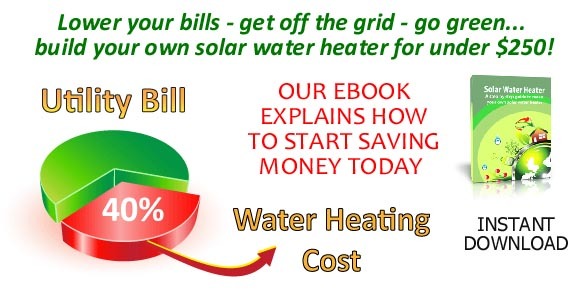 Browse the first few pages of the Solar Water Heater ebook now! 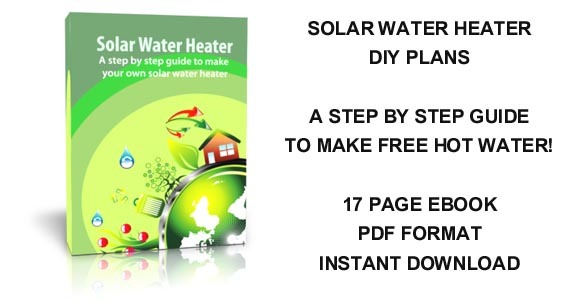 Solar Water Heater is a 17 page ebook available by instant download in pdf format for you to print or view on your computer. CLICK HERE to read the first 6 pages for FREE! Most people know about the installation fees that are associated with home solar systems. But there are also the local permitting and inspection fees that most people don’t know about. The permitting and inspection fees alone can add $2000 to $3000 to the installation fees. So when you get a quote from a local contractor, be sure to ask all the necessary fees. If you only consider the solar panels and installation fees, they don’t seem to be that bad. Keep in mind that the solar panels and installations fees are only 60 to 70% of the overall cost. Permitting, maintenance, and future repairs are another 30% that you don’t usually think about right away. Consider all the necessary cost before you decide on installing solar systems. Will you still be able to offset the cost in 10 years? Are you going to stay in the house that long? Most people use passive solar heaters to heat up water for their homes. Others use solar cells for electricity. If you’re considering solar panels for electricity, the cost of purchasing and installation can be overwhelming. Not all families get to recoup the investment. In today’s economy, every few people know that they will get to stay in the same area for more than 10 years. You never know when you would have to relocate. Sometimes to areas beyond commuting. When you sell your home, the solar panel investment might not add too much value to your house. Yes, you can argue with the potential buyers, but it’s a buyer’s market right now so sometime you don’t have an option. If your new job is waiting and the old paycheck is done, you will have to sell and relocate. Very few families can carry two mortgages at the same time. So think about the recouping time vs the benefits before you decide on installing solar panels. But one thing for certain is that you’re helping the environment. Solar panels are expensive. They’re not a small investment that you make on your roof to save a few bucks a month on your electricity bill. The average cost is around $10,000 or more. And that’s just for the solar panels. The installation fees are added and can vary largely depending on your area. You can get the 30% federal tax credit and other rebates. But it is still a large sum comparing to other home improvements. You might not ever to recoup the amount it you’re going to move in a few years. With today’s job market, you just don’t know when you have to move out of the area. However, if you’re already retired or near retirement, or have a job that’s tenured or self employed, solar panels can be a good investment. It might take you years to recoup the cost, but you’re doing something good for the environment and you will recoup eventually. Just won’t happen in 5 or 8 years. Properly controlling moisture in your home will improve the effectiveness of your air sealing and insulation efforts, and vice versa. Thus, moisture control contributes to a home’s overall energy efficiency. Be sure to use humidifier in winter and dehumidifier in the humid summer months. The best strategy for controlling moisture in your home depends on your climate and how your home is constructed. Before deciding on a moisture control strategy for your home, you may first want to understand how moisture moves through a home. In most U.S. climates, you can use vapor diffusion retarders in these areas of your home to control moisture. Proper ventilation should also be part of a moisture control strategy. Daylighting is the use of windows and skylights to bring sunlight into buildings and homes. Daylighting in businesses and commercial buildings can result in substantial savings on electric bills, and not only provides a higher quality of light but also improves productivity and health. Daylighting in schools has even improved student grades and attendance. For homeowners, daylight can also reduce electricity usage. If you work outside of home and are away most of the day, you probably will not notice the big difference. But if you stay at home or work from home, daylighting can make a big difference from light to heat. Today’s highly energy-efficient windows, as well as advances in lighting design, allow efficient use of windows to reduce the need for artificial lighting during daylight hours without causing heating or cooling problems. For older homes, the windows are not well insulated and usually were designed in small sizes. If you have the means to replace them, you should take advantage of the solar energy. If you happen to live in the northeast where winters are long and cold, new and energy efficient windows can save you a lot in the long run.